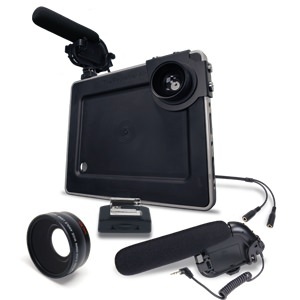 The Padcaster transforms your iPad Mini 1-3 into an all-in-one mobile production studio that is rugged, elegant and versatile so you can create professional quality video content that inspires. With the included wide-angle lens, Padcaster shotgun microphone and dual mic/headphone cable, all you need is an iPad and your imagination. Use with your favorite apps to shoot, edit and upload video on the fly – or stream live right from the iPad. As seen on TV and on BBC news. One (1) cold shoe adapter.